Bali, also known as the ‘Island of the gods’, this paradise island is famous for its sophisticated temples and the hearty warmth of natives. Bali, the island as well as the province of Indonesia, is full of springs, dense jungles, villages with a wonderful culture. Beaches beauty with endless length; extensive rice fields have given off her wet fragrance; many past and present temples, the more refined Hinduism religion, and a simple lifestyle make this paradise. Although it sounds extraordinary but truly Bali is a paradise on earth. Whether you are planning to celebrate your honeymoon, or want to set foot on “Paradise“, we recommend this small island to make your trip unforgettable. 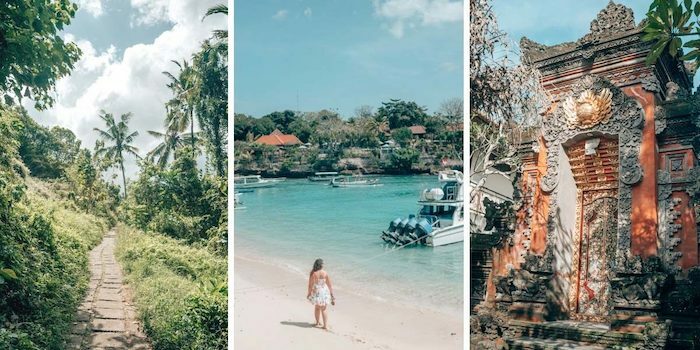 Bali offers everything you could want; from deserted beaches of white sand sheltered by long lines of palm trees like a dense jungle, you can get lost if looking for adventure in this dense jungle. All surrounded by vast rice paddies carved by Balinese mountainous landscape and carrying the viewers through a journey of exoticism, magic, and fantasy hidden places, as an island of a thousand gods. If you want to wrap yourself in a world of spirituality and good energy, immerse yourself in the magic of Bali, paradise on earth. Bali is one of the 11,000 islands that make up Indonesia. It is the most visited and the most authentic island.Bali is known worldwide for its precious temples, dances and the friendly people.Besides being a place of relaxation, Bali is also an island with lots to see, let’s have a look at the main places that grab your attention in Bali, Indonesia. The vast rice fields of Bali offer the most beautiful scenery that can be seen on the island. One of the best ways to get into the Balinese culture and learn about the daily life of its inhabitants is to visit a traditional village. The Balinese people are very religious and this is something which is reflected in temples form, in Bali, there are more temples than houses. Apart from main temples and shrines, every family has its own religion place at home in Bali; there are about tens thousands of temples in Bali. The best time to come to any of the temples is full moon days when the shrines are dressed with moonlight and crowded with nonstop visits of faithful people. Located on the slopes of sacred Mount Agung, the Mother Temple Besakih is composed of 22 different sub-temples. It is the most sacred temple in Bali. Pura Ulun Danu Batur is a beautiful temple dedicated to the god of the lake and is the most important of the Balinese temples after Mother Temple of Besakih. This Bali Temple (Pura Taman Ayun) is an attractive temple surrounded by a mantle of exotic vegetation. The Temple of Earth on Sea (Pura Tanah Lot) is a stunning Hindu temple, located on a small island 100 meters off the southwest coast of Bali. Located on a cliff 75 meters high, the Luhur Uluwatu Temple is one of the most beautiful and popular temples of Bali. Pura Gunung Kawi is a public temple; here the members of the royal family are buried. The Elephant Cave, also known as Goa Gajah, is a public temple built in the XI century. It is an important pilgrimage center in Bali. Located in the heart of Ubud, Monkey Forest is a nature reserve forest with over 27 hectares area, where almost all kinds of monkeys inhabited. The Moat Garden (Taman Gili) is the only part of the Klungkung Royal Palace which is preserved today. The Bat Cave is a temple over 1000 years old, played a major role in the rituals associated with life after death. And do not forget to shop in Bali; it’s also a heaven for shopaholics.